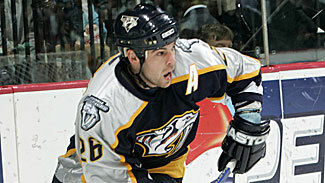 As much as Steve Sullivan hopes his extraordinary comeback story has a happy ending, the Nashville Predators do, too. "The timing for us is good," coach Barry Trotz told NHL.com. "We need a positive story." That's because they're reeling now, fourth in the Central Division and falling fast out of the playoff race. Their offense is in such a drought that General Manager David Poile told NHL.com he has never seen anything like it in all of his years in the League. The Predators entered Thursday's game against Pittsburgh losers of five straight and just 3-9-1 since a three-game winning streak at the beginning of December. They had scored just 21 goals in those 13 games. "If it's one thing that ails the Predators now it's our lack of goal scoring," Poile said, "and that's Steve Sullivan's strong suit." Clarification: That was Steve Sullivan's strong suit. Nobody, not even No. 26, who has 228 career goals, including 62 in 150 games with the Predators, knows what his strong suit will be now, or if he'll have one at all. Sullivan is pretty much starting his second career Saturday night and he's doing it with no pre-determined goals other than to be a helpful player. If there is pressure for him to produce, he's not feeling it now. "My teammates know how it feels when you're out a week or 10 days, and they know how hard it is to come back in and be productive. They know it won't be overnight," Sullivan said. "I'm not going to be the same player, production-wise, as I was when I left. I just don't want to hinder the hockey club. I don't want to be making mistakes out there. If I can do that, it will give me time to be the best player I can be in this second time around. Hopefully that's as close to the old player as possible." Poile said just from watching Sullivan practice that he believes he can be effective on the team's 28th-ranked power play right now. Sullivan has scored 55 power-play goals in his career. "That alone would be tremendous for us," the GM said. But neither Poile nor coach Barry Trotz want to set any standards for Sullivan either. "The underlying issue is will his back hold up under the real game conditions," Poile said. "There are a lot of question marks out there. This will be quiet the comeback if can make it." Steve Sullivan will take his pre-game nap, or at least attempt to, Saturday afternoon. He'll eat his usual pre-game meal and take his normal route from his house to the Sommet Center in downtown Nashville. He'll be wearing a suit, just like he has for the last 76 Predators' home games, but this time he'll get a chance to change out of it. For the first time in 22 and a half months, Sullivan's No. 26 jersey will be hanging in his locker stall Saturday night. If Sullivan makes it through Saturday's game against the Chicago Blackhawks healthy, he will finally be able to turn the page on one chapter and flip to the start of another in arguably the most remarkable comeback story in recent NHL history. Sullivan has missed the last 153 Predators' games, including 11 in the postseason, with what can loosely be called lower back problems. He isn't quite sure of the technical term of his injury, but that never really mattered anyway. His painful back problems kept him from being a hockey player for almost two calendar years. And, really, all Sullivan ever wanted to be was a hockey player. "You don't realize it until it's gone, you really don't," Sullivan told NHL.com in a phone interview Thursday. "You'll never be ready to leave the game, but not being able to leave on your own terms was very hard to look at. I just think that you don't realize the camaraderie, the friendships and the fun times you have. When you're going through a season you always feel like it's a grind. You're thinking, 'Oh, we have another practice,' or 'Oh, we're going on the road again.' Until someone takes it away from you, you don't realize how fun that really is." 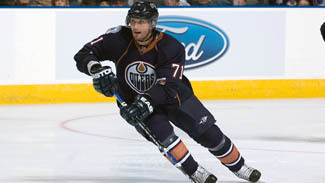 Sullivan, who has 577 points in 723 NHL games, last took a shift just before overtime against the Montreal Canadiens at the Sommet Center on Feb. 22, 2007. It wasn't a hit that knocked him out, but rather a strange, contorted twist he made that caused his back to go out of whack. "We were shorthanded and I was backchecking, coming back into the zone. The puck got rimmed around the wall and I started making the cut to the right and I looked over my left shoulder to see where my teammate was because I knew it was going to be an odd-man rush," Sullivan recalled. "As I looked over my left shoulder and turned back to grab the puck, my back just seized up. Every muscle in my back just tightened up. I tried to go down and take a shot on net, but I wasn't very successful at that. I tried to let the momentum turn me. I was bent over and off the ice I went." He underwent two disc operations, but all the doctors could prescribe was time. "We had to retrain the mind and go from baby steps to build it and strengthen it," Sullivan said. "We needed to have success." Success was elusive last season. Sullivan would attempt to start his rehab, but the next day he would wake up crooked and crawl out of bed. He couldn't do simple things like kick a soccer ball or swing a golf club. He couldn't play with his four children. He had no athleticism, and that sapped his enthusiasm. "I would wake up crooked, wait three or four more days to straighten out, and then I'd try again," he said. "After a while that just got very mentally straining on me and draining because there was no success. There were just a lot of failures." Sullivan said he remained sane only because he immersed himself in his kids' lives. He attended every one of his oldest son's hockey games and practices. "They really kept me busy," he added. But they couldn't make him a hockey player again. As Sullivan eventually realized, only he could do that for himself. So, he adopted a different mindset before this season, a positive mindset and a more proactive approach, which he admittedly didn't have last season. It surprised the people around him, especially Predators coach Barry Trotz, who told NHL.com that once he saw how much Sullivan struggled last season he figured he would never see the former 30-goal scorer play in the NHL again. "He sort of took control and said, 'I'm going to get through this,'" Trotz said. "I know he did a lot of reading in terms of dealing with getting through this problem because it's more of a mind-over-matter-type of thing. He just sort of came around and said, 'I'm getting this done,' and right after training camp he had a more determined approach than ever before. There was more conviction. He understood what he was going through because he read up on it. He got stronger." Sullivan decided to stop going to his rehab facility and instead started going to the rink. He wanted to be around his teammates, work out in the Predators' gym and "just be a Nashville Predator again, not the guy the boys see in the suit after games. "I wanted to do everything possible to being a hockey player again." But Trotz informed Sullivan he would be doing it all under the Predators' watchful eye. "I'm going to ask our strength coach to push you harder than you ever have been pushed," Trotz said he told Sullivan. "And, when you think you are coming around I'm going to ask him to push you harder." The trainers didn't want Sullivan to lace up his skates because "we didn't want him to get the, 'I'm OK' feeling," Trotz said. "We wanted him to get as fit and strong as possible and then go to the next thing. For the first time he said, 'I will do whatever you want me to do.' "
Sullivan was pushed to the limit, sometimes beyond. "If he thought he could get on the ice the next week, we'd say two more weeks in the gym," Trotz said. "Everything was 20 percent more." "You don't realize it until it's gone, you really don't. You'll never be ready to leave the game, but not being able to leave on your own terms was very hard to look at. I just think that you don't realize the camaraderie, the friendships and the fun times you have." "The hard part was being pushed to your limits every day and getting back up, but the good thing about it was as hard as it was when I was doing it, the reward was when I woke up the next morning I wasn't crooked," Sullivan said. "I didn't mind going back the next day because now, even though I knew it would be a hard day in front of me, there was a really good chance I would succeed and that made it worthwhile." He's a success story right now, but with an asterisk. Sullivan has been practicing in full contact drills for a couple weeks, but he's "extremely nervous" about playing the Blackhawks because "Saturday night is the ultimate test," he said. Sullivan claimed he's more nervous to play Saturday than he was for his NHL debut back in 1995-96 when he played for the New Jersey Devils. It's keeping him up at night, which is causing him to fall asleep at odd times during the day. "I have had to do some drills with our strength coach where I take some hits in the corner, but I haven't had a defenseman pinch down on me on the half-wall and take that hit," he added. "Saturday night is when we are going to find out. It's not going to be love taps. It's going to be a game situation where the other team is preventing me from scoring and doing my job. We've done as much as we can without playing a game, and now is it good enough for the game? We have to go find out. "I hope it's a story that has a happy ending."